My first project with Wilma. =) A small table topper using one mini charm pack of Moda Printemps by Three Sisters and the Falling Charms tutorial by Missouri Star Quilt Company. Love this machine! It takes some getting used to, just like driving a different car. It works the same, but it feels different. The more I play with her, the more comfortable I am with her. I bet you DID have a lot of fun with Wilma. Very pretty table topper! I should be getting my BLOCK magazine shortly. I got the very first one, and was very impressed. Yes. It is more like book. Well worth the money, which is very reasonable! Wilma! Love the name! I think I signed up to get Block. I saw the first issue and was very impressed. Really impressed by the graphic design part of it. Now you make me want to get my Sophie Cheryl out of the box. LOL! I LOVE IT! I have one very similar to it that used to belong to my grandmother. I won't part with it! The perfect project for Wilma. She seems to sew like a dream! I had to scroll back to find that Wilma is a genuine antique and not a brand new replica - beautiful! Amy, your quilt top looks pretty! I am waiting for my Block magazine also and it should be here soon. I have a FW too, but don't get it out often. Every so often I try to test my vintage Singers, just to make sure they are running okay, and give them some oil. HEEHEE....I didn't realize Wilma was your "new baby"!! I thought you were sewing at a "friends" house! !....that mag/book looks like a must have too!...project looks sweet!! Love her so nice and shiny. Makes me want to dig mine out. My mom got the very first Block magazine. They do a great job with it. Wilma Lucille is gorgeous. You are going to love her. I have 2 and I just love to hear them sewing. She's a beauty! And so is the table topper! I hope my issue of Block arrives soon! Is the full magazine good? Sometimes you have one good pattern and the rest isn't very good. Can you buy single issues somewhere or only by subscription? Love your first project with Wilma. How fun! I am definitely going to check out the magazine. LOVE your first project with Wilma! The sashing colour is perfect for spring! 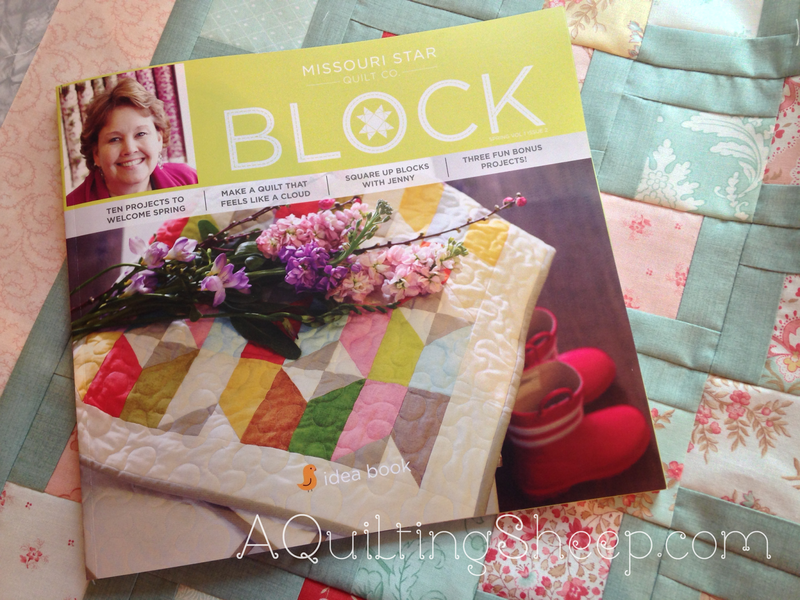 I saw the first issue of Block, but didn't buy it - now I'll have to look for this one - that cover quilt looks fantastic! those colors are so sweet and the book looks like a keeper. the featherweight is a keeper as well, I need to get mine out and fix my lawyer a fleece throw. 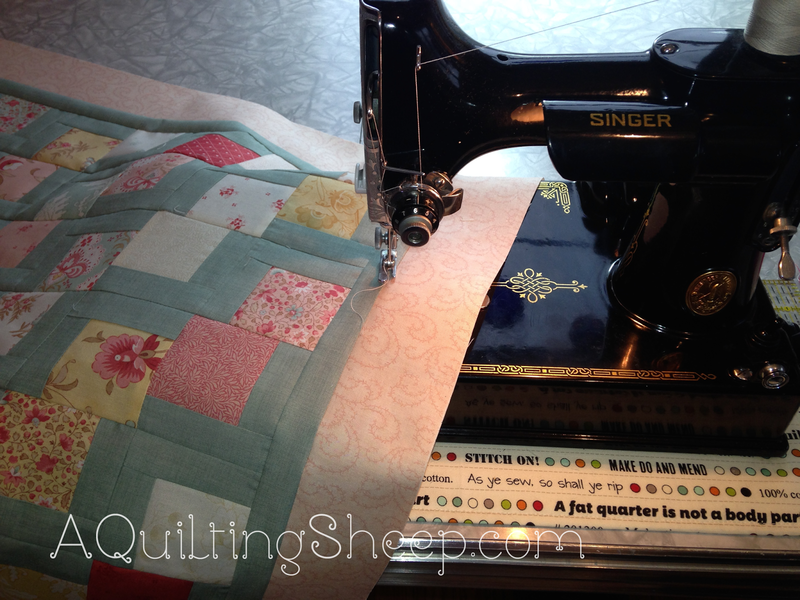 Nice little quilt you and Wilma are working on. I think I am going to have to subscribe to that magazine for a while. Looks like a good one.